I am a proud member of the HSUS (Humane Society Of The United States) and now donate monthly to them simply, very easily with my credit card. Yes I am Canadian but the HSUS has had to come up here to Canada to help SHUT DOWN Puppy Mills so of course I support them. Plus the fact the HSUS is known World Wide for their dedication to STOP ANY AND ALL ABUSE OF ALL LIVING CREATURES. Everytime I receive a video of the horrendous conditions of these dogs found when they raid Puppy Mills, it breaks my heart. But on this last raid, one dog in particular didn't just break my heart, it shattered my heart. For a few days I simply did not know if I could go on. In my heart, I knew this dog could not have survived but I needed to know in order to find peace within me. 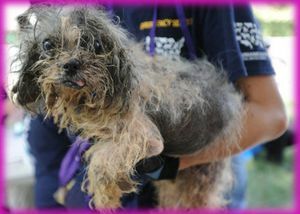 In the video of the rescued 500+ dogs from the horrendous Puppy Mill in Texas on August 11/2009. In the video, Scotlund Haisley (GOD BLESS THIS MAN) kneels down and removes a dog (perhaps Shih Tzu type) from the bottom kennel on the left. The dog is in such bad shape, barely moving, only his tongue can barely come out of his mouth and make a licking motion. I got the immediate feeling that the kind, gentle Mr. Haisley felt there was NO HOPE for this dog. I am so upset and heart broken over this one dog in particular (Over all of them but worse with this dog), that I cannot rest until I know if he/she not only survived but will become a candidate for adoption. IF SO BAD OFF, IT WAS BETTER TO EUTHANIZE THAN SAVE, I WILL UNDERSTAND THAT FINE AS I ALSO RESCUE DOGS) BUT I MUST KNOW. I have very little money but could contribute towards this dog in particular (I do donate from Canada here when I have a few extra dollars already). Please do not just discard this email or send me a FORM LETTER...........I really need to know. I raise dogs humanely and rescue not only dogs in need but any animal in need, money permitting. Gayle - Thank you for your inquiry, and for your support of our mission to end the cruel puppy mill industry. I believe you are referring to the elderly black/white shih tzu in the picture below. This dog was probably 15, and very ill. She was rushed immediately to the emergency vet where they tried to make her comfortable and assess her health. Unfortunately she had extensive cancer and other ailments that could not be treated. She was shown love and compassion in her final hours and humanely euthanized. When she was rescued we called her Babe, and some of our followers set up a memorial site for her. FOR A FEW SHORT HOURS BEFORE DEATH, GIVEN THE PRECIOUS NAME "BABE"
A Memorial website for Babe was created by Laurie Hanan. At this site, you can read about Babe , post a greeting, share in the guestbook, view a photo album and more. or to view the video of the Rescue and how my heart was shattered by "Babe"